The FightinPhillies.com blog is a member of the BBA, and recently the Baseball Bloggers Alliance had a vote for the election of players to the Hall of Fame. The real vote has yet to be revealed that is done by the Baseball Writers Association of America, or BBWAA. Their official results are known to all on January 8th 2014 but until then, check out the BBA results. December 30, 2013: The Baseball Bloggers Alliance today recommends three players from the official Hall of Fame ballot to be inducted into Cooperstown this summer. Pitchers Greg Maddux and Tom Glavine, most closely associated with the Atlanta Braves, and long-time Chicago White Sox first baseman/designated hitter Frank Thomas reached the 75% threshold when BBA members cast their ballots. Maddux, a four-time Cy Young Award winner for the Braves, pitched from 1986 to 2008 and won 355 games while posting a 3.16 ERA and striking out over 3,300 batters. He had a career WHIP of 1.143 in just over 5,000 innings and an ERA+ of 132 over that span. His best season was 1995, when he fashioned a 19-2 record with a 1.63 ERA, good for a bWAR of 9.7 that year. Thomas played from 1990 to 2008, all but the last three season on the south side of Chicago. He has a career slash line of .301/.419/.555 and fashioned an OPS+ of 156 during his playing days. He put up his highest single-season bWAR in 1997, when his 1.067 OPS and 35 home runs played a large role in his mark of 7.3. Glavine’s career spanned roughly the same time frame as Maddux’s, with Glavine starting in 1987. He won the Cy Young in 1991 and 1998 and finished runner-up two other times. His career ERA was 3.54 and he won 305 games during his tenure with the Braves and the New York Mets. Glavine had a 1.314 WHIP for his career and an ERA+ of 118. In 2010, no player reached the 75% mark in BBA voting, while the writers inducted only Andre Dawson. In 2011, the BBA selected Roberto Alomar and Bert Blyleven and both were inducted into Cooperstown that summer. In 2012, Barry Larkin and Jeff Bagwell were selected by the BBA, but the writers only took Larkin. Last year, the bloggers again picked Bagwell, while the writers could not agree on anyone to honor. 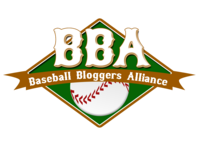 The Baseball Bloggers Alliance was established in the fall of 2009 for the purpose of fostering collaboration and communication among bloggers from across baseball. The BBA currently has approximately 240 blogs in its membership, including some of the most prominent blogs on the Internet, spanning all major league teams and various other general aspects of the game.